Here’s one of those science experiments you can only do when it’s very, very cold — vaporize hot water! We first got this experiment from Mad Science of Minnesota , who posted it to their Facebook page in 2011. 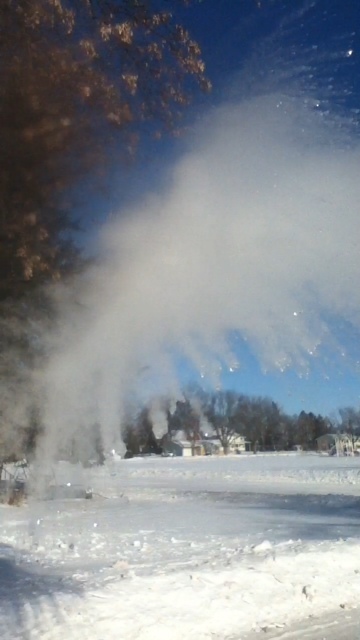 A fun thing to do in extreme cold is to throw hot water into the air. Take a flask and fill it with boiling water to warm it up, pour this away and fill it again. Take the full flask outside, take a cup of this hot water and throw it all up into the air. As the +212°F water meets the cold (in this case -26°F) air, it instantly vaporizes. Most of it is turned into a cloud of steam that drifts gently away and some of the droplets that stay together are instantly turned into small pieces of ice that can be seen streaking down towards the bottom left in this photograph. Note – this only happens with very hot water – cold water just lands as cold water. I have been able to get this to work at temps below -10, warmer than this it does not work. MAKE SURE AN ADULT HELPS YOU WITH THE HOT WATER. Evaporation plays a key role in this fun phenomenon. Evaporation is the transition of water from the liquid phase to the gas phase. The rate of evaporation depends on the temperature difference between the water and the air, and evaporation is more rapid in low humidity. Hot water is closer than cold water to evaporating, so your cup of near-boiling water is already close to becoming a vapor. It takes time for the energy contained in a hot object to be transferred to a cold object. However, the rate of heat transfer is proportional to the temperature difference between the two objects, so hot water will lose heat faster than cold water. In other words, if you have water at 90 degrees C and water at 10 degrees C and the freezer is at -10 degrees C, the hot water will lose heat five times faster than the cold water; however, the cold water will still win the race. As the hot water cools it’s rate of heat transfer will decrease, so it will never catch up to the cold water. This worked well for us with just a small pan of boiling water. We didn’t have a thermos (flask) to carry it in, so my husband just brought the pan out. It made a giant cloud of vapor that drifted off, with some of the water staying in liquid form and coming down (see the video for one of our attempts). Our temperatures were around -15 F but we also walked down the driveway and around to the front of the house so our kids could have a good view, cooling the water considerably. A thermos would help keep the water even hotter, though. A sweeping motion works best, as it disperses the water more and increases its surface area. This speeds the rate of evaporation. Despite reading online that a super soaker full of hot water would make steam, that didn’t work much. It does make puffs of steam, but much of the water just shoots out as water. It’s still cool, though, and worth a try if you have a super soaker (large squirt gun). A pan full of regular hot water did not work at all. It stayed in liquid form and we just flung water up in the air. It’s uncertain how cold it has to be in order for this to work. Mad Science says that this won’t work well over -10 F, but I’ve seen the experiment posted online as a success when it was as high as 8 F. It might be worth a try to see if you can get partial results though. Make sure the boiling water is handled by an adult (or responsible teen). Be careful when throwing the water, as wind can bring it back onto you. Luckily, in these temperatures it’s no longer hot by the time it gets to you. Still, use extreme care in keeping yourself and others from getting splashed.